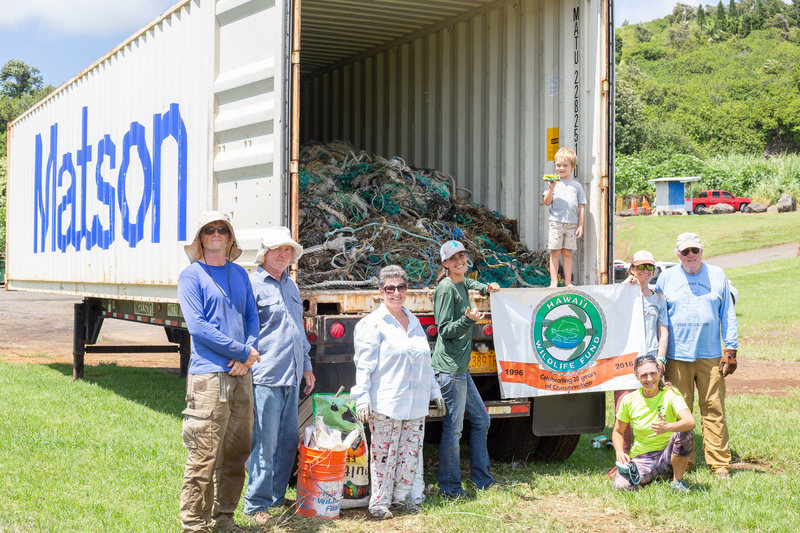 On Earth Day, Sunday, April 22, 30 volunteers removed 864 pounds of trash from the Manukā Natural Area Reserve (NAR) on Hawai’i Island. It’s a long and rough four-wheel-drive road to reach the black sand beach. 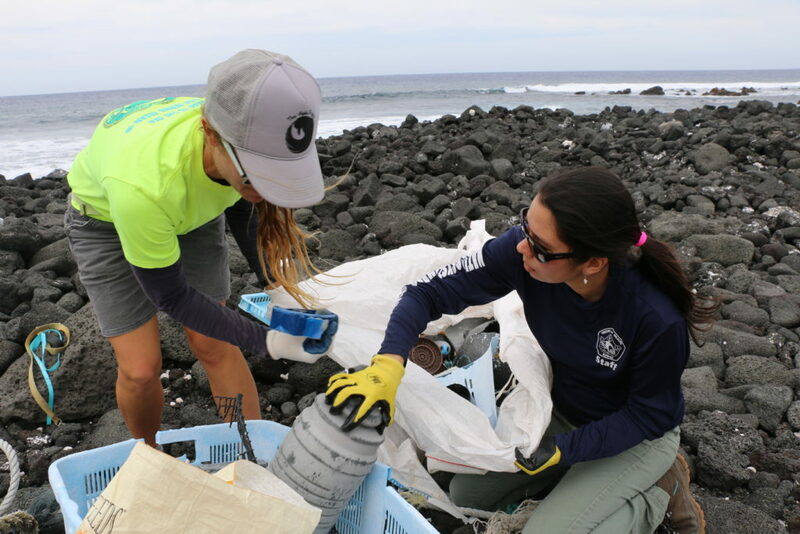 That didn’t deter Hawai‘i Wildlife Fund staff, representatives from federal and state agencies and volunteers from making the trip for nine consecutive “Earth Days” with a singular mission in mind—to remove plastic debris, derelict fishing equipment and nets and the typical trash produced by all of us. This triangle-shaped NAR stretches mauka to makai from 5,000 feet in elevation down to a coastline marked with a single black-sand beach surrounded by rugged lava fields for as far as the eye can see. That makes this annual debris clean-up organized by the wildlife fund different than many others where volunteers fan out across white sandy beaches to collect, recycle or dispose of what they find. It’s a neverending cycle. Megan Lamson of the Hawai‘i Wildlife Fund explained that the southeast shores of Hawai‘i, due to prevailing ocean currents, are magnets for everything that gets dumped into the ocean… on purpose or inadvertently. “In total, more than 200 volunteers have removed over 6,300 pounds of marine debris and shoreline-user litter from the area over nine years, during 10 collaborative cleanups,” Lamson said. 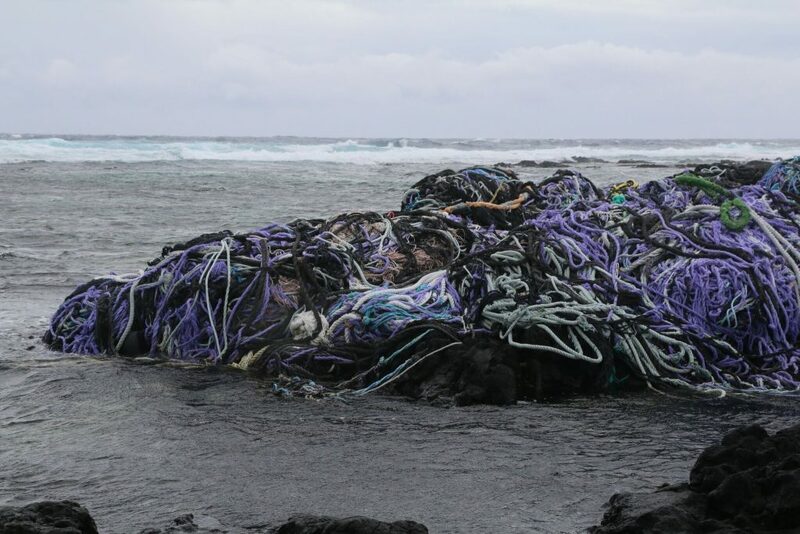 The Manukā NAR may not be as well-known as nearby Kamilo beach, often referred to as “Plastic Beach,” for the amount of debris that washes ashore there. But there’s plenty of it here and yesterday alone a team of 30 people removed 864 pounds of trash. About one quarter of it is fishing net that will be recycled in the nets to energy program. Another 300 pounds can be recycled by Terracycle. The remaining, 26 large feed bags will be disposed. It’s important to note that this program is mindful of adding as little as possible to landfills. The Manukā NAR is an important breeding location for the critically endangered hawksbill turtle and is marked with numerous anchialine pools, unique eco-systems which support species that live in a mix of fresh and salt water. Anya Tagawa of the DLNR Division of Forestry & Wildlife Natural Area Reserves System agrees that this particular clean-up tends to be tougher than many others. Since this NAR is relatively remote and this portion is not visited by tons of people, it’s thought most of the debris comes from afar. 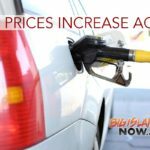 That’s common for the origins of debris across Hawai‘i but doesn’t mean we all shouldn’t practice the 4-R’s—Reduce, Reuse, Recycle, Recover, the DLNR said. 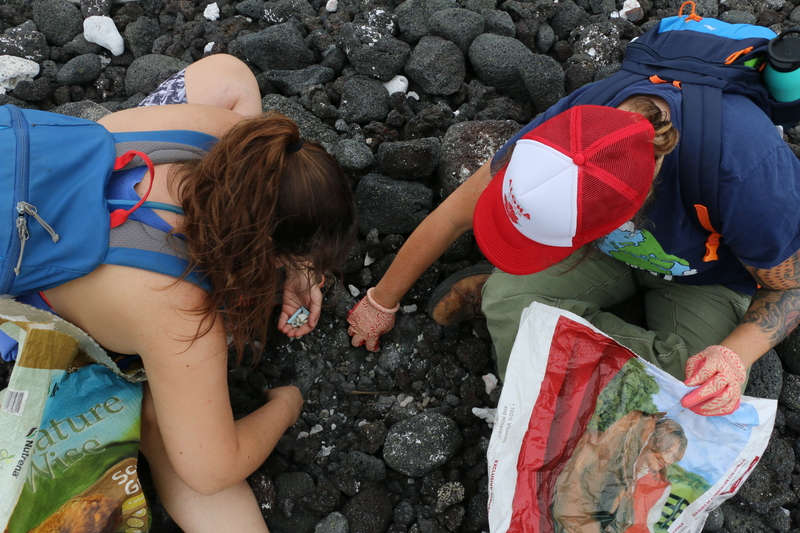 Joel Nathansen, a high school teacher in Hilo, brought one of her students to the Manukā cleanup day. She and many other of the volunteers believe that despite the constant need to be cleaning up shorelines across the state, people, especially young people, are really grasping and practicing the 4-R concept. 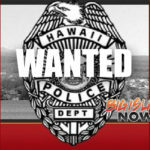 “This is my responsibility; it’s everyone’s responsibility; it’s our kuleana,” Nathansen said. 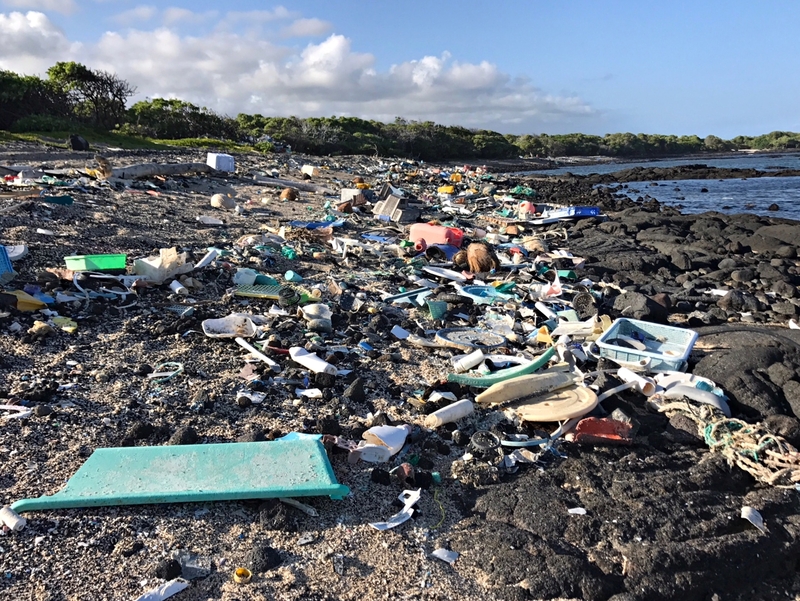 In the next few months, the Hawai‘i Wildlife Fund, its partners and volunteers are expected to reach a milestone with nearly 500,000 pounds of rubbish being removed from Big Island beaches. At Manukā, for the Earth Day 2018 cleanup, other participating agencies included the DLNR Divisions of Aquatic Resources and State Parks, the U.S. Fish and Wildlife Service, the National Park Service and of course, the volunteers who are critical to these types of efforts.